Spintires: MudRunner is the latest edition to the best-selling off-road simulation game Spintires. It is believed that this will be a massive edition to the game, following with improved graphics and impressive realism. Spintires: MudRunner is expected to be released in October 2017 so we are all waiting for the day when we could finally download Spintires game. The upcoming edition to the popular game will have lots of new and exciting features. There will be 13 all-terrain vehicles added so you will be able to choose from 19 vehicles in Spintires: MudRunner. Each of these vehicles has their own different characteristics and equipment so you will never feel bored. The newest Spintires edition will also have a new Challenge mode with 9 new maps, following a mysterious giant Siberian sandbox environment. Spintires: MudRunner will have a new game mode for solo-player and 4-player teams. So whenever you feel the need for a company or to play on your own – you have all the choices. Just download Spintires: MudRunner and prepare for your off-road adventure. Download Spintires: MudRunner game and dig into the most dangerous missions, full of risky objectives and deliveries. You will need to complete your missions while driving through unseen places, extreme environments and rough conditions. To complete your objectives in Spintires, you will have a map, a compass and your wonderful driving skills. So don’t miss it – download Spintires: MudRunner as soon as it appears on sale. Spintires: MudRunner will also have lots of exciting game mods. These mods, varying from maps, vehicles, repaints, textures, tweaks, wheels and more, definitely adds more excitement to the game. 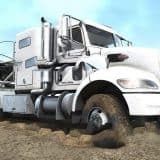 It is extremely easy to download Spintires: MudRunner mods, so feel free to add them to your game and customize it the way you love. New mods appear every day, so don’t forget to check what’s new in the Spintires game fans community and download all the latest mods. 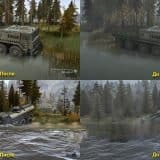 In order to download Spintires: MudRunner game, there are minimum and recommended system requirements for the smooth and successful operation of the game. Spintires: MudRunner system requirements are expected to be announced soon. So it is not much left till we can all download Spintires: MudRunner and enjoy exciting off-road adventures, following by impressive graphics and catchy game scenario.